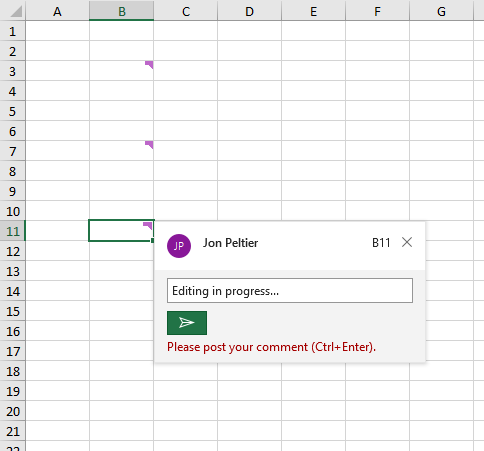 As part of Microsoft’s new philosophy of releasing new products when they are ready, rather than waiting for the next big release every three or four years, we now have Threaded Comments in Excel. If you have Office 365, you may already have Threaded Comments, if you are on an accelerated “Insider” release schedule, or you may see it sometime soon. If you have the perpetual license version of Office 2016, you don’t get the same feature enhancements as Office 365 subscribers. 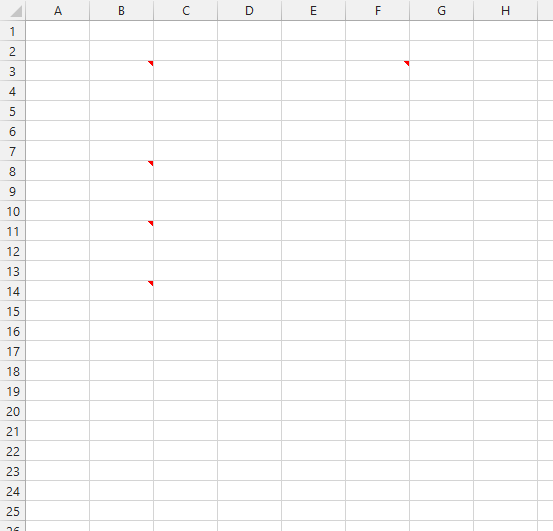 And of course, you won’t see them in Excel 2013 and earlier. What are these new Threaded Comments? Doesn’t Excel already have comments? 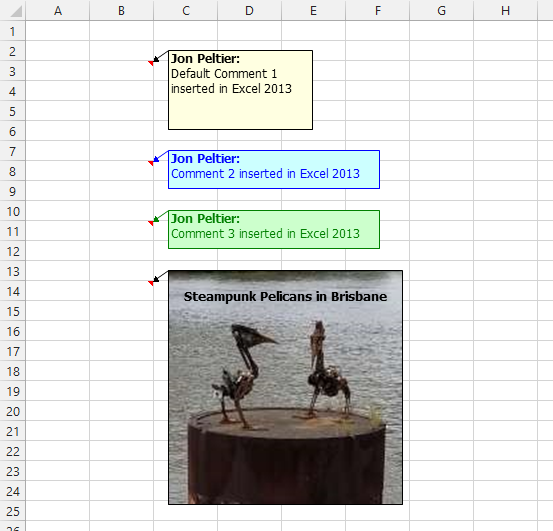 Threaded comments allow for discussions within and Excel workbook. They are a lot like comments on a blog or forum, or on a web site like Facebook. You can have multiple comments, and other people with access to the workbook can enter their own comments, or reply to yours. Here we see two comments in the new Comments task pane. The second comment, posted by one of my accounts (with the “JP” icon), shows a reply by another of my accounts (with my picture), and another reply by a third account (with the lone “J” icon). 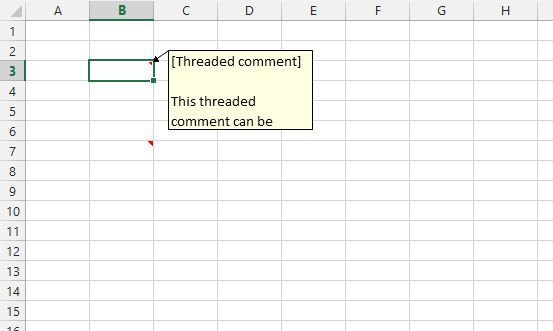 In this post I will give a summary of Notes in Excel (as the old-style comments have been renamed), then I’ll show a little bit about the new Threaded Comments, and talk about compatibility between them. Comments were first introduced in Excel 5/95, when they were called Notes, and the interface to work with Notes was rather cumbersome. In Excel 97, Notes were renamed as Comments, with the interface we are now so familiar with. Comments have become indispensable for documenting worksheets and helping users navigate through models and dashboards. 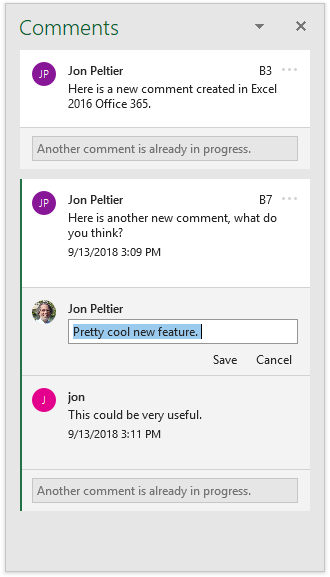 When Threaded Comments first came out, Microsoft referred to the old-style comments as Legacy Comments. I don’t care for that “Legacy” adjective, because it makes me fear that the item will disappear. In later releases, the Legacy Comments are now referred to as Notes. The best news about Threaded Comments is that they will not replace Notes; Threaded Comments and Notes can coexist side-by-side in a worksheet. 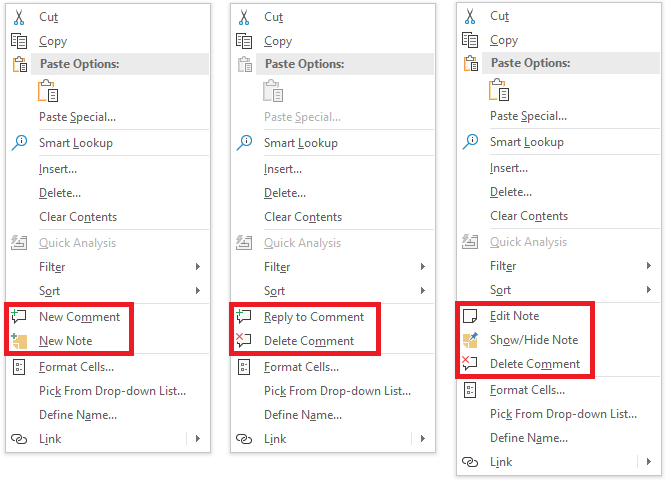 Everything in this section that refers to Excel 2013 Comments is valid for Excel 2010 and earlier Comments and for Excel 2016 Notes. 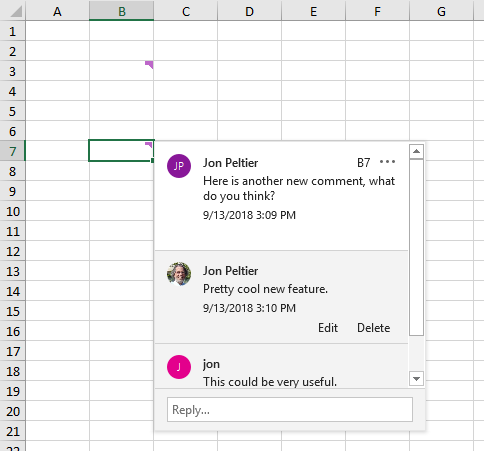 In Excel 2013, you can access Comments through the Review tab of the ribbon (I will use Excel 2013 to show these old-school Comments, since my Excel 2016 has been updated through Office 365). In the Comments group there are buttons to insert a new Comment, navigate among Comments, and show or hide Comments. You can also create a Comment using the context menu, when you right-click on a cell (below left). If the cell you right-click on already has a Comment, you have some Comment-related items on the context menu (below right). When you hover over a cell with a Comment, the comment appears, with an arrow pointing back to its parent cell. This is the default size and appearance of a Comment. You can resize Comments, and format their fonts, borders, and fills like any other shapes. And you can choose to show certain shapes even when the mouse isn’t hovering over their cells. You can even format their fills to contain pictures. You could set up a catalog or invoice that shows an item’s picture when you mouse over its name or description. And like other shapes in a worksheet, you can change their shapes, like the star in the screenshot below. By default, Comments are not visible, but the top right corners of cells containing Comments are marked with small red triangular indicators. When you hover the mouse over one of the indicated cells, its Comment appears. In Excel options, you can change whether to hide the indicators, or whether to show the Comments and indicators all the time. Because of the flexible formatting capabilities of Comments, they can be helpful in documenting worksheets and guiding users performing their tasks. In some ways, the Threaded Comment story is like the familiar Comment/Note story. Here is the Review tab in the Excel 2016 ribbon. Remember that now Comment means Threaded Comment, and the Comments described in the previous section are now Notes. The familiar Notes commands are available on a menu next to the Comments commands. The right-click menu for an arbitrary cell offers Comments and Notes, though a given cell can have only one or the other (below left). 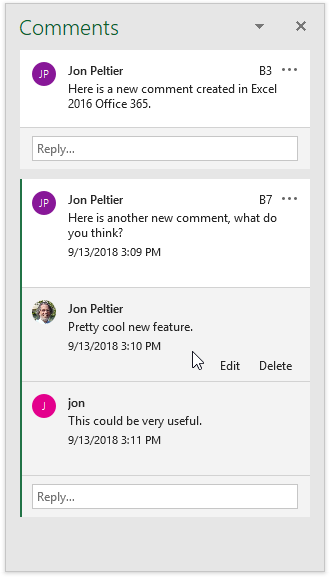 The context menu of a cell with a Threaded Comment allows you to reply to the cell’s Comment or delete it (below center). 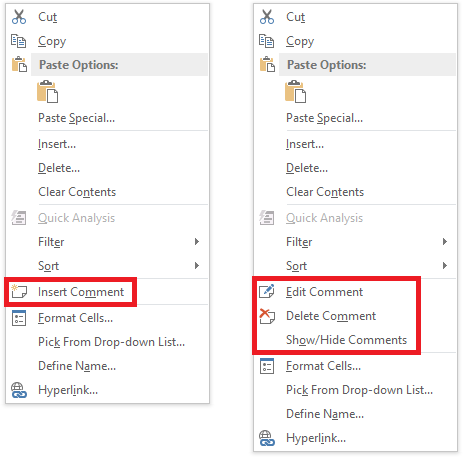 The context menu of a cell with a Note lets you edit the cell’s Note, show or hide it, or delete it (below right). I’m sure the “Delete Comment” note will soon be corrected to “Delete Note”. This feature is very new, and in the weeks since it was first rolled out to bleeding edge subscribers, it has already evolved quite a bit. Click Create Comment from the ribbon or context menu, and an indicator appears with a comment in edit mode. The indicator is a purple polygon, not a red triangle, and the comment shape looks like a discussion element from a web page: the author’s name has an avatar, either initials as shown below or a picture. Click the green button to post (send?) the comment. This comment has been posted. The time and date are shown, along with its parent cell address, and a link to edit it. When you click the three dot icon at the top right, a lone menu item give you the option to delete the Comment. Threaded Comments can be used alongside Notes. This is very important, because their features mean are important for different uses: Notes for documentation, and Comments for discussion. 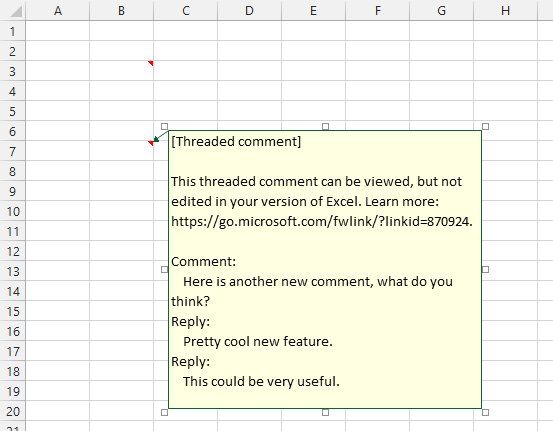 In the first Excel build that included Threaded Comments, it seemed that Microsoft wanted to change all Notes to Threaded Comments, but now it is clear that the features are parallel but not interchangeable. While Notes can be formatted with different colors, shapes, and even images, the appearance of Threaded Comments cannot be manipulated. Mouse away from the cell and the Comment hides, leaving behind its strange purple indicator. Here we see another comment which I wrote from one account, and then replied to from two other accounts. 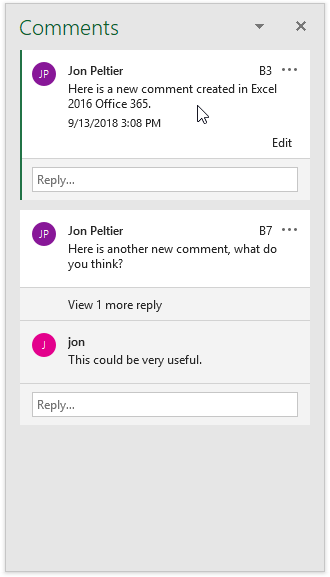 Excel isn’t necessarily going to become the chat app of the future, but Threaded Comments are going to be helpful when people are collaborating on a worksheet model and discussing where data comes from and what approaches should be used. Here we see another Comment being edited. When we mouse away from the new Comment, which is still in edit mode, it hides, and leaves behind a larger indicator to indicate that it’s awaiting an action. If you hover over another cell, its Comment reminds you that there is an unposted comment somewhere being edited. While one Comment is being edited, you can view but not edit other Comments. If you click on the “already in progress” message, the active Comment appears, with a big reminder to post it (or you could click the big X in the top corner to delete it. Unlike Notes, you can’t show multiple Comments in the worksheet at the same time. 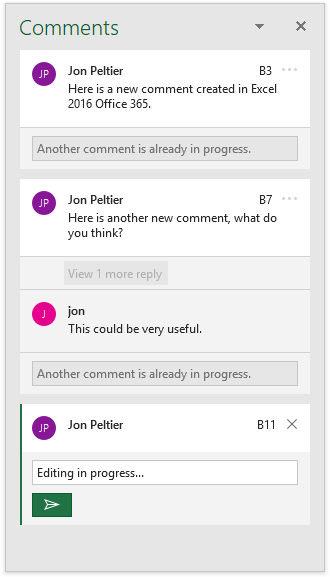 Clicking “Show Comments” in the ribbon opens a task pane that contains all of the Comments. Here are the first two Comments above. My mouse cursor is hovering over the first one, and we can see the time it was posted and the Edit link. My mouse cursor has moved over the second Comment, so we see now when the Comment and its replies were posted as well as the Edit link for the Comment. Moving the mouse over the first reply to the second Comment shows its Edit link and a Delete link. I showed before that the Delete command for the Comment was found by clicking the three dots; deleting the Comment deletes the entire thread. When you are editing a Comment or reply, you see the same “already in progress” message as before. Here is a view of our “in progress” Comment from before. If I try editing one of the other Comments or replies, I am reminded to post this comment. If I have an unposted Comment and I try to close its workbook, I get a warning. I can post the Comment, delete it, or cancel closing the workbook. 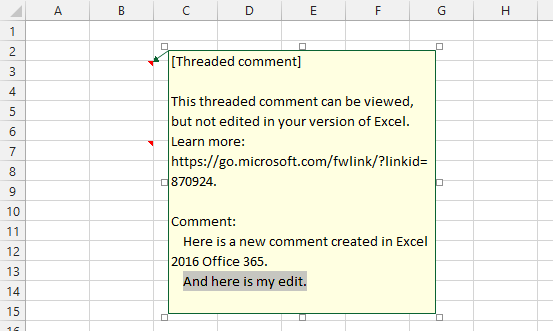 Threaded Comments are new to recent builds of Excel 2016 through the Office 365 license. 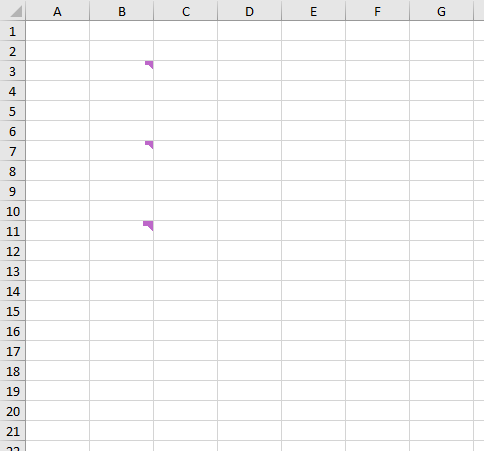 What happens when somebody opens your file on an older version of Excel? Microsoft says that they can be viewed but not edited. 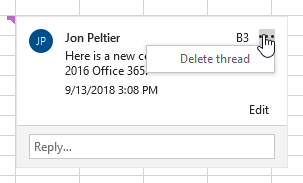 I saved my file with Threaded Comments that I made in Excel 2016, then I opened it on another computer that has Excel 2013. In this section, “Excel 2013” is a stand-in for any “non-Threaded-Comment-enabled version of Excel”. As you recall, there was one Threaded Comment with a single message and no replies, and another with a message and two replies. 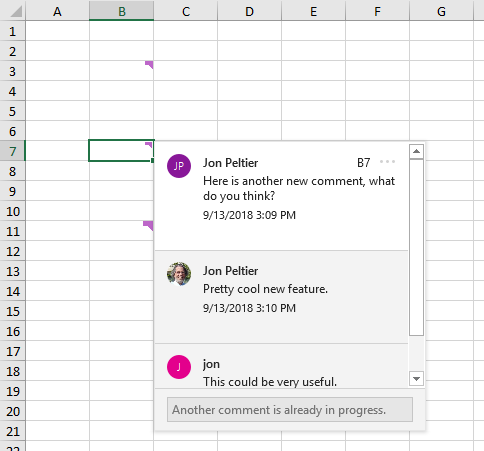 The first Threaded Comment looks like a Note (i.e., a “legacy” Comment) in Excel 2013. It is the same size and formatted with the same colors as the default Notes in 2016 and Comments in 2013. I can stretch the comment to read what it says. 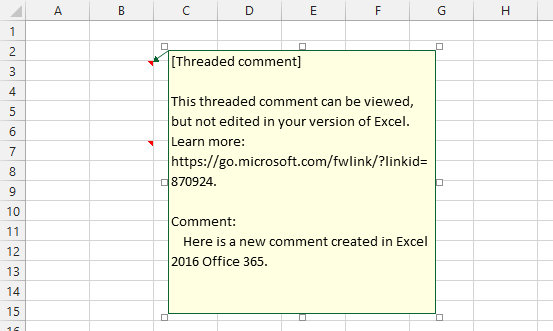 There is a header in square brackets that indicates that it is a Threaded Comment, which can be viewed but not edited in this version of Excel, and there is a link where Microsoft has posted more information. And below all the boilerplate, we see the message that was written in Excel 2016. We only see the text part of the message, not the sender or time it was posted. Let’s look at the message with replies. Same notice at the top about Threaded Comments, and under that we can read the message and replies. Again, we only see the text, and not the sender or time sent. For fun, I added a little bit of an edit to the message, highlighted below, to see what would happen. 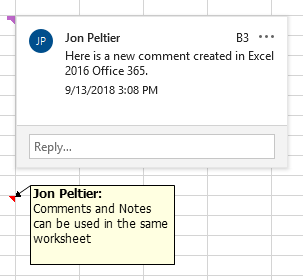 The little edit I’ve made in the Threaded Comment remains in the old-style Comment, even after I save, close, and re-open the workbook, but only in Excel 2013. But as soon as I open the workbook on my Office 365 computer, the edit is gone, and the Comment has reverted to the Threaded Comment that I’d saved in Excel 2016. 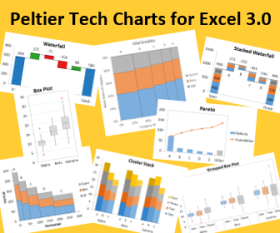 Posted: Tuesday, September 18th, 2018 under Excel Features. Tags: comments, Notes, Threaded Comments. Your thread’s comment is helping to learn about the EXCEL. The blog you posted is quite interesting and knowledgeable. Keep up the good work and keep sharing informative things.